Backlist books is a column by Lucy Day Hobor that focuses on enduring, important works from or about Asia. 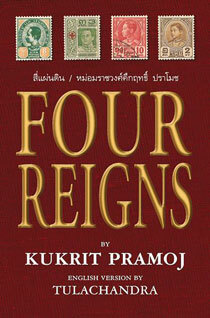 This post is about Four Reigns, a nostalgic historical novel set in Thailand that tells the decades-long story of a Thai woman living under the reign of a series of four kings in the period from 1882 to 1946. Trained as a girl in the palace as a royal attendant, she experiences the ups and downs of daily life and the changing of the times from a privileged point of view. Even-keeled to a fault, she tries to hold her family together, though they have different roles to play in a changing society and thus do not always see eye to eye. This 663-page novel, originally written as a series of newspaper columns by an Oxford-educated Thai writer and statesman, was published in book form in 1953 and translated into English in 1981. As well as idealising the national pride of the Thai people and their reverence for Thai royalty, the novel illustrates a kind of Buddhist fatalism or detachment from material things and circumstances beyond one’s control. See below to find out what you need to know to decide whether you should read Four Reigns, or what you should know about it even if you never do! Whose reigns were they, and what historical events are depicted? The four kings whose reigns are referred to in the title are shown on postage stamps on the cover of the English edition shown above, available from Silkworm Books. King Rama V (King Chulalongkorn) reigned from 1868 to 1910. In the first third of the novel, Thailand is operating under an absolute monarchy under this king, who dies from illness. King Rama VI (King Vajiravudh) reigned from 1910 to 1925. Whether influenced by or in an attempt to influence foreigners, this king resolves to take only one wife. Thailand suffers shortages during World War I. This king dies from illness. King Rama VII (King Prajadhipok) reigned from 1925 to 1935. Under the reign of King Prajadhipok, Thailand comes under the influence of politics, a powerful and divisive force said to have been absent from Thai society thus far. After the revolution of 1932, the country emerges as a constitutional monarchy, though not an unchallenged one. This king abdicates. King Rama VIII (King Ananda Mahidol) reigned from 1935 to 1946. World War II begins, the Japanese occupy Thailand, and the Allies drop bombs on Bangkok. The war ends. This king dies an early death, though we are not given the details, merely told that they are “devastating beyond words”. What makes the story interesting? For readers not terribly interested in history or politics, the appeal of the book lies in the interactions between the characters and in the descriptions of the various Thai customs they observe, adapt or abandon. There are soap-opera aspects to the personal drama lived by Phloi (the central character) and the people who surround her. She falls in love, but marries a different young man, one chosen for her, after her sweetheart marries another woman. Phloi’s younger sister elopes with a kind but penniless doctor, in part to escape Phloi’s bitter and tyrannical half-sister, who dotes on her brother, a wastrel from whom she must eventually flee. Phloi’s children have personalities and fates as diverse as her siblings do: one son is a late-bloomer, one joins the military, one brings home not a few farang (foreign) ideas from his studies abroad, and the daughter, perhaps unsurprisingly, behaves in ways Phloi and others of her generation never would have done. The detailed descriptions of Phloi’s world contribute as much to the appeal of the book as the sequence of personal and political events in her life. The translation deftly explains foods, plants and animals, hairstyles, articles of clothing, social values, gestures, common words and phrases and even Thai grammatical concepts with which English-speaking readers are likely to be unfamiliar. For example, there is not only a system of royal and noble titles, there is a system according to which personal pronouns (e.g., I, you) must change depending on the relative social status of the speaker and listener. If the queen could become ruler like the king, it followed then that women as human beings were on the same level as men and could step into positions usually held by men if given the opportunity. That men were lords of their households and women more or less their dependents might be the prevailing situation but [it was] by no means an unalterable one. Whether or not the depiction of Phloi in particular or upper-class Thai society in general is accurate, Four Reigns artfully gives us some idea of how things might once have been in Thailand. For much more information summarising and contextualising the work, read Paul Trafford’s seven-part review of Four Reigns.